Posted in Consciousness, Evolution, Imagination, Krishnamurti and tagged Consciousness, Evolution, Imagination, Krishnamurti. This website is where I first read about Krishnamurti and his thought. It is a bit disorganized and sluggish as of late, as it has been under renovation, I think, but it has some great stuff. 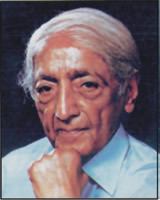 The focus is Sufism and Advaita Vedanta, though other traditions, and figures, such as Krishnamurti, are also featured. Just a few text based selections; lots of videos are there too.